Mission: Whenever the Xi'an volunteers take on a need in the community, thousands of people from its immense network turn out to give their time, resources, and care for the public good. Description: The Xi'an Volunteer Association is one of the most active public service organizations located in the ancient city of Xi'an in Shaanxi Province. It routinely mobilizes over 6000 volunteers and 5000 online micro-bloggers, in addition to holding 150-200 charitable events year-round with support from hundreds of colleges and local businesses. ​Mrs. Cui Yulan is 81-year-old who lives with her son's family in a unit less than 40 square meters in an old building. She has two grandchildren going to elementary and junior high school. Grandma Cui suffers from a variety of diseases and is bed ridden. She could only sit on a wheelchair in the narrow corridor looking at the people downstairs. Her only son also lost his ability to work due to illness. The local community offered both him and his wife to work at the garage to help them to make basic living. After understanding the family situation, the local volunteers would deliver fresh fruit and vegetables weekly and taking care of some of the chores around the house. They would also bring grandma Chu to stroll around the community when the weather permits. They have helped this family for four years. ​Cuo e zhen is a town located at Xianyang Sanyuan of Shaanxi Province. In this town, there is a desolate and quiet village called Guan Zhuangcun lives more than 100 families. 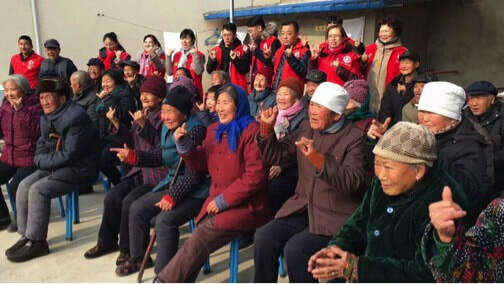 There are about 30 elderly men and women were left alone, either abandoned or are empty nesters, and live in a very difficult life of poverty and loneliness. 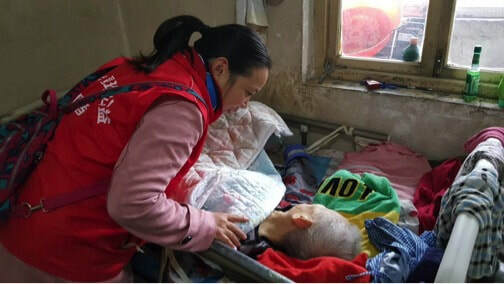 Volunteers of Shanxi work tirelessly hand in hand with people from all walks of life to help to look after these elderly people on a regular basis. They have established good relationship with these seniors. Xi'an Volunteer Association routinely visits rural schools and homes, where they give out donated school supplies and clothing items so that the children will have resources to study and remain warm for the upcoming winter. Realizing the children's hardships, Xi'an works o bring them relief and reasons to smile. 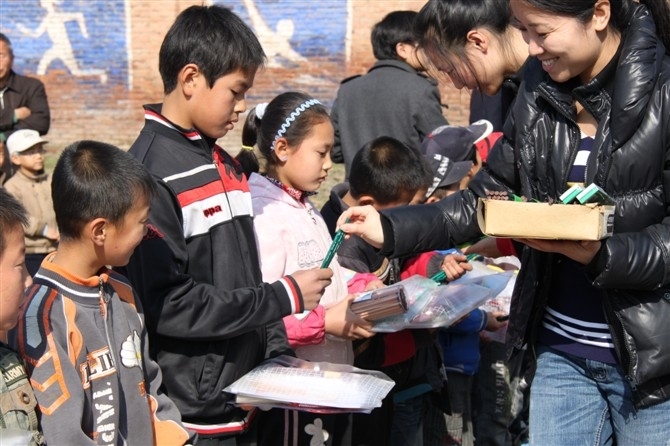 One of Xi'an's major projects is to help underprivileged students pay for their tuition and school supplies and provide them employment after school so that they can give back to their communities. Xi'an also cultivates student volunteers through various public service activities. Here is a 40-year-old man with Osteogenesis Imperfecta, a bone disease that has earned its sufferers the nickname "porcelain doll." In November, he was happy to receive visit from the Xi'an volunteers, who made sure he was getting the care and treatment he needed. Despite the rain, these volunteers from the Xi'an Volunteers Association are hard at work with environmental projects around the city park. Their bright red hats and clothing got soaked but they persisted, and the passerby took notice of their good service.